Kaijucast host and podcaster extraordinaire, Kyle Yount (that's me! ), stumps a majority of the crowd that came out to Geek Trivia on Tuesday, November 2nd at Vendetta. Oh boy, oh boy, oh boy! So I spoke about this in my last couple of episodes, but for anyone who has stumbled upon this page without listening, I just want to talk about how cool this event was and what it continues to be on a bi-weekly basis. 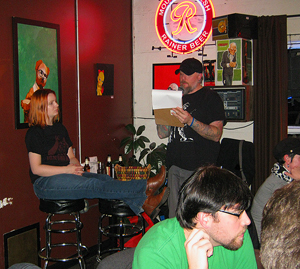 Every other Tuesday night, both Things From Another World and a local bar here in Portland called Vendetta put on a Trivia Challenge specifically focused on geek knowledge. This has been happening for quite some time, but I have only been going since May (and I think I’ve only missed two evenings). The big news for Geek Trivia around that time was that Things From Another World was sending a lucky winner to San Diego for the one, the only Comic-Con. Competition was fierce and the questions were brutal, but still a lot of fun. I specifically remember only scoring three points in one round of twenty questions (which most likely had potential bonus points too). In the “end” one lucky winner was sent to SDCC and had a great time. Pervious hosts have been Aaron Duran from Geek In The City radio, Capt Redgoat of PDX Yar, Cort & Fatboy from the Cort & Fatboy show, Tyler & Joshua from Old Town Computers & Backspace, Art & Brandon from Ground Kontrol, The Crimson Marmot & Uniscorn from the Alter Egos Society, Adam from Atomic Arts, Rachel from Dark Horse, Kaebel & Merrick from the Sequential Art Gallery, Mary-Suzanne & Myrr from Someday Incubator and I know I’m forgetting a couple in there! So here’s how it works: The host for the evening has to come up with forty geek-related trivia questions (two rounds of twenty questions each plus those extra bonus points). At the bar, people form into teams of up-to-five players and the host starts the questions. At the end of the first round, the teams trade papers with other tables in order to grade their opponents’ answers. The host then reads the answers and listens to the cheers and groans of the trivia enthusiasts. After the results are tallied and checked over, the first round winners for first, second and third place are given their prizes. After all of the teams retrieve their answer sheets, they flip to the “Round 2” side and the second barrage of questions begin. Typically, the second round is more difficult than the first and the contestants tend to get a little less chatty in order to concentrate as the process repeats the basic steps of Round One. Because I was the host for this evening, my usual team and I arrived (shout-out to “Voicemail Of Cthulhu”!) as early as we possibly could in order to make sure I had enough time to set up and for the team to secure a decent table. Even though the event starts at 7pm, seating starts to get scarce pretty early! One time we arrived so late (because of traffic) that we actually had to sit at the bar itself… all in a line. Let me tell you, it was not conducive for free flowing team huddles. So for the Kaijucast Geek Trivia night, we actually had a tie-breaker for 2nd and 3rd place in the second round. How did I option to settle that tie? “Name all of the Godzilla monsters on my arm in 30 seconds” and we immediately followed that up with another tie-breaker for the grand prize of the evening where one representative from each group had to name as many of the 15 monsters from Godzilla Final Wars in one minute. It was grand fun for myself and I have a good feeling that the attendees had a pretty fun time as well. I know that Geek Trivia is just about done with the special guest hosts and the regular host is going to take over – which will be great, too. If I was ever offered the opportunity to come back to the microphone in order to test the nerd mettle of the crowd, I’d jump at the opportunity! The next guest host will be the crew from Book-cycle PDX – another member of the awesome group of geeks on November 16th. Because this event has really become a highlight of my regular activities. I thought it would be fun to post the questions that I asked of the Geek Trivia gurus. I would also like to again congratulate the two teams who took top place in both rounds: The Gluons and PDX Yar! 1. True or false, the world’s largest Star Wars costuming organization is the 501st Legion? 2. In The Venture Bros, Dr. Venture has occasionally found himself at odds with a Fantastic Four-like team. Who voiced the leader of this team, Professor Impossible during the first two seasons? 3. In a graveyard near Bereznik, Hellboy battled a famous Russian witch. What is the name of this witch? For a Bonus point, what was the outcome of this fight? 4. What is the name of the magazine that first featured Tank Girl? 5. Which American actor portrayed reporter Steve Martin in both the 1956 American release of Godzilla King Of The Monsters and Godzilla 1985? 6. What is the name of Cassie Hack’s partner in the comic series Hack/Slash? 7. For one point total, what are the names of the four robots on Mystery Science Theater 3000? 8. In the show Dead Like Me, what were both the real and assumed names of Ellen Muth’s (“Myooth”) character (don’t need last names)? 9. The most recent young woman to take up the Batgirl mantle is Stephanie Brown. But prior to donning the cowl, she patrolled the streets of Gotham under a different persona. What was the name of that heroine? 10. In the classic Star Trek episode Arena, the Enterprise is in pursuit of a ship that destroyed a Starfleet Base on Cestus III when both ships are captured by the Metrons. Kirk and the captain of the other ship are forced to fight to the death, but after besting his opponent, Kirk refuses to kill the other captain. What is the name of this adversary? 11. What two Godzilla movies did MST3k feature in their Comedy Central run? 12. Which Family Guy character played Boba Fett in Something, Something, Something Dark Side? 13. True or False, Fox is currently airing brand new episodes of Futurama? 14. We all know that Samuel Jackson currently fills the role of Nick Fury in the Marvel Movie Universe, but in a lesser-known film made for television who played Nick Fury: Agent of Shield in 1998? BONUS: What big box retailer sold the DVD as a store exclusive in 2008? 16. For one point each, name the actors who played the following villains in Sam Raimi’s Spiderman trilogy: Green Goblin, Doctor Octopus, Sandman, Venom? 17. In the DC Vertigo title, Fables, the subjects of famous fairy tales are living amongst the Mundys in New York in order to escape the evil Adversary, whom they later declare war upon – while on his own personal mission, Boy Blue discovers the true identity of the bloody-handed Adversary. Who is, in essence, the adversary? BONUS: Who was rumored to be the adversary before copyright problems forced Bill Willingham to take a different direction? 18. In 1963, Godzilla special effects director Eiji Tsuburaya started his own production company eventually leading to a show about an interstellar police officer that fought monsters in almost every episode. It was so popular that spin offs and movies still continue to the day in Japan. What was the name of this series? 20. In Star Wars: A New Hope, in which Mos Eisley docking bay was the Millenium Falcon parked? 1. In the dubbed version of the 1968 Destroy All Monsters, the narrator names the Island where all of the earth’s monsters are imprisoned. What is the name of this island? 2. Richard Ayoade (eye-oh-AH-day) plays Maurice Moss in the IT Crowd alongside Matt Berry who plays Douglas Reynholm, but the two also starred on another British series about an over-the-top 1980s horror infused hospital drama. What was the name of this show? 4. In the Futurama episode “Where No Fan Has Gone Before”, which member of the Enterprise crew is killed by Melllvar? 6. What’s the name of Rob Zombie’s animated film based on his comic book of the same name? Bonus Question: Who played the voice of Dr. Satan in the animated film? 7. At this year’s New York City Comicon, IDW Publishing announced a new comic series entitled “Godzilla: Monster World”. What well-known slackjaw scribe will be writing this series? 8. For one point each, what two games did Wil Wheaton’s team best Sheldon’s team in Season three of The Big Bang Theory? 9. What co-creator of the original Tank Girl has been working with Damon Alburn on a popular British music project since 1998? Bonus Point, what is the name of this project? 10. Which giant monster has fought against Godzilla more times than any other – Is it (A) Mechgodzilla (B) Mothra or (C) King Ghidorah? 11. In the Wild Hunt, what royal title did Hellboy finally assume? 12. According to Vork in Season 4 of The Guild, the answer to a majority of multiple-choice questions is always what: A, B, C or D? 13. In 1996, Godzilla won the MTV Movie Awards’ Lifetime Achievement Award. What famous sci-fi icon presented the award to producer Shogo Tomiyama? 14. What are the odds of successfully navigating an asteroid field? 15. What was the name of the device that killed the original Godzilla? Bonus: What was the name of the 1995 monster born from the original use of that device? 16. In 1971, what comic book artist created Big Barda, Mister Miracle and an entire cast of Apokaliptic characters for the Fourth World Saga? 17. For one point total, name the last four Doctor Who companions? 18. In 2006, Steven Colbert initiated his first Green Screen Challenge, where viewers made their own video backdrops for a green-screened shot of Colbert’s waving a lightsaber around like the Star Wars Kid. While the winner was declared to be Bonnie R from California, who was the other finalist? 20. For one point each, name each of the six Bounty Hunters shown on the bridge of the Executor in The Empire Strikes Back. Bonus point for the correct ordering from left to right on the screen. As you can see above, there are a number of local entities involved with this event including yours truly at the Kaijucast. Look for more events from the fine folks and if you want to check them out online, make sure you look at the “Portland Geeks” page here at Kaijucast.com!